I have realized some errors in using OM Chant 2.3 (I think it is late version) on OM 6.15. 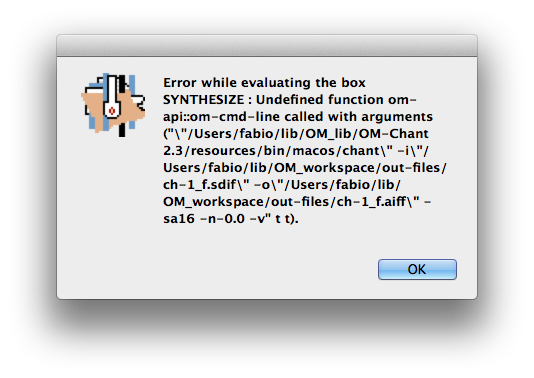 Whatever patch I can run, comprised those of OM Chant tutorials, I receive the error in enclosed screenshot. Every help will be very appreciated, thank you in advance. Hi, can you try to remove all *.64xfasl file from your OM-Chant/sources/ directory, ther restart/relmoad the lib ? Thank you very much for fast reply. I have removed all *.64xfasl files, done some tests on patches of mine and Chant tutorials, now it seems to me everything runs perfectly. Only if useful, I was forgotten to say that my system is still 10.8.5. Ciao.